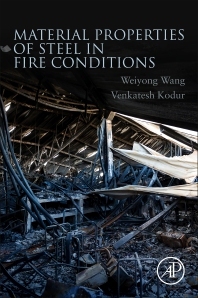 Material Properties of Steel Fire Conditions is a major new contribution on how to understand the material properties of steel in fires. The application of new types of steel and development of sophisticated codes of practice has grown dramatically in recent years, making this a timely resource on the topic. Under fire conditions, knowing the material properties of steel is essential in the fire resistance design of steel structures, such as in Eurocode3. This book shows that the reduction factors of mechanical properties of different steels are quite different. In recent years, the authors of this book have carried out significant testing on the material properties of several types of steels, such as Q460 steel, Q690 steel and A992 steel, etc. Users will find this new test data on the material properties of steel with temperature useful in evaluating the fire resistance of steel structures in their own projects. Weiyong Wang is an associate Professor and associate director in the Institute of Safety & Disaster Prevention Engineering of College of Civil Engineering at the Chongqing University (CQU). He received his Ph.D. from Tongji University, China in June 2008. In September 2010, he was promoted to an associate professor in structural engineering at Chongqing University. From March to July 2010, he worked as a visiting Professor in Tokyo University of Science, Japan. From January to November 2011, he worked for Professor Kodur as a research associate in Michigan State University, USA. From May 2014 to September 2015, he worked as a visiting scholar in University of Texas at Austin, USA. Venkatesh Kodur is Professor and Chair person in the department of Civil & Environmental Engineering, and also serves as Director of the Center on Structural Fire Safety and Diagnostics at the Michigan State University (MSU). He received his M.Sc. and Ph.D. from Queen’s University, Canada in 1988 and 1992, respectively. Dr. Kodur's research has focused on the experimental behaviour and analytical modelling of structural systems under extreme fire conditions; Constitutive modelling of material properties at elevated temperatures, developing guidelines for fire resistance design of structural systems, Evaluating fire performance of high performing materials; Performance based fire safety design, Non-linear design and analysis of structures, Failure investigations. He has collaborated closely with various industries, funding agencies and international organizations and developed simplified design approaches for evaluating fire resistance, and innovative and cost-effective solutions for enhancing fire-resistance of structural systems. Many of these design approaches and fire resistance solutions have been incorporated in to various codes and standards (NBC, ACI, ASCE, SFPE). He has published over 300 peer-reviewed papers in international journals and conferences in structural, material and fire resistance areas and has given numerous invited key-note presentations. He is a professional engineer, Fellow of Canadian Academy of Engineering, Foreign Fellow on Indian National Academy of engineers, Fellow of ASCE and Fellow of ACI and member of SFPE. He serves as Associate Editor of Journal of Structural Engineering and Journal of Structural Fire Engineering, Chairman of ASCE Standards Committee on Fire Resistance, Chairman of ACI-TMS Committee 216 on Fire Protection and a member of EPSRC (UK) College of Reviewers. He has won many awards including AISC Faculty Fellowship Award for innovation in structural steel design and construction (2007), NRCC outstanding achievement award (2003) and NATO award for collaborative research. Dr. Kodur was part of the FEMA/ASCE Building Performance Assessment Team that studied the collapse of WTC buildings as a result of September 11 incidents.